For a number of reasons I have elected to stay clear of discussing lights in the works. There is no telling how or when the vapor will actually materialize. 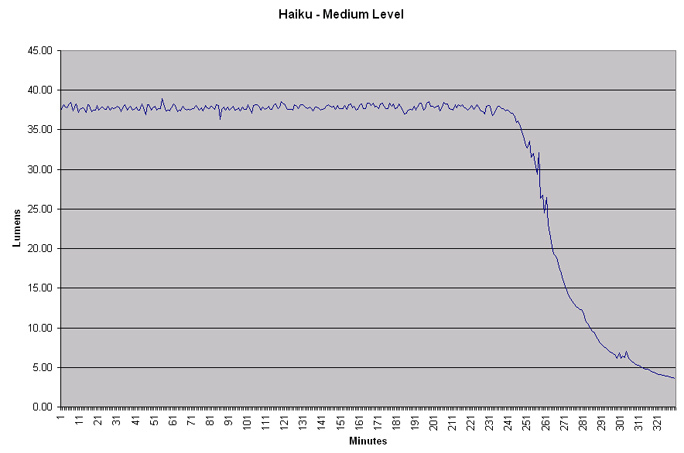 I have a new light that I have been working on for a good number of months now and it is past the vapor state. I have been given some deserved flak about the naming of my various lights and it sure gets confusing for everyone, especially me. This new light has a simple and hopefully unique (for flashlights) name. It's called the Haiku. I wanted a name that somehow alluded to the three levels and I also wanted to give recognition to the Japanese designer of the 3 speed converter which is at the heart of this light. The English version of Haiku is a three line poem that is quite limited in words and yet hopefully accomplishes that which it sets out to illuminate. 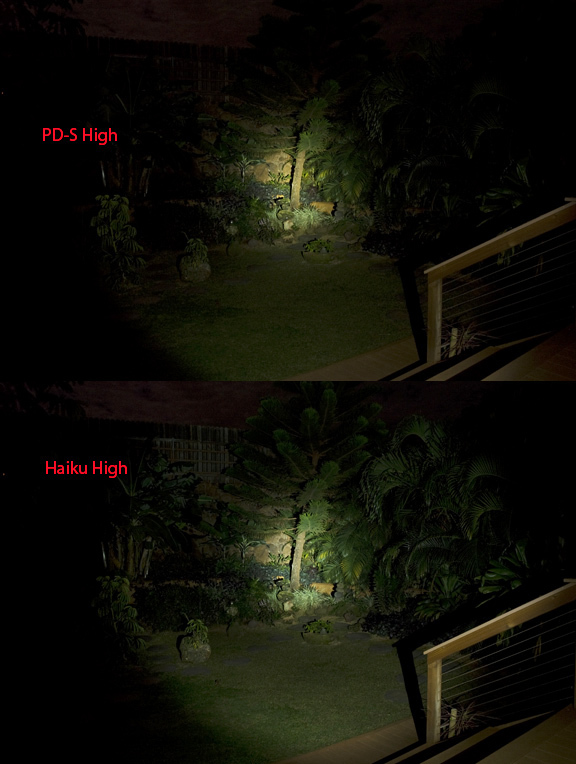 The Ti Haiku is a simple light with three levels of output and hopefully it provides the illumination required of it. 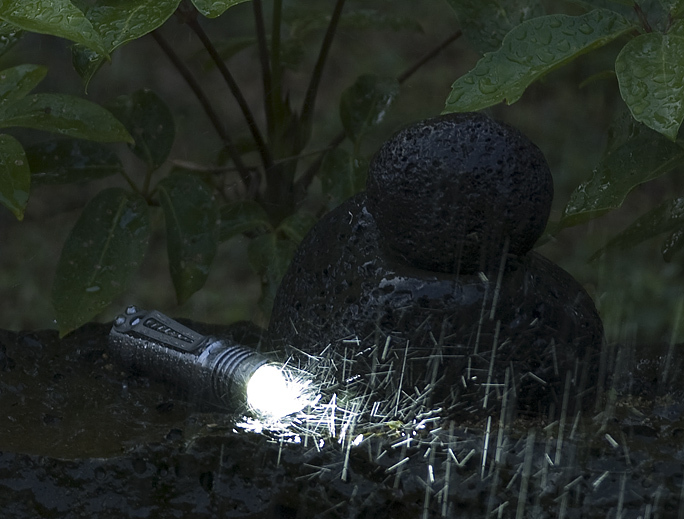 The Titanium Haiku is a 1 x CR123 powered flashlight. The Light Engine is a "three speed" Buck/Boost converter driving a Cree XR-E LED (Q5WG bin). The three drive levels are approximately 25, 125 & 650 mA to the LED with typical out the front flux (lumens) of 4, 30 & 135 respectively. 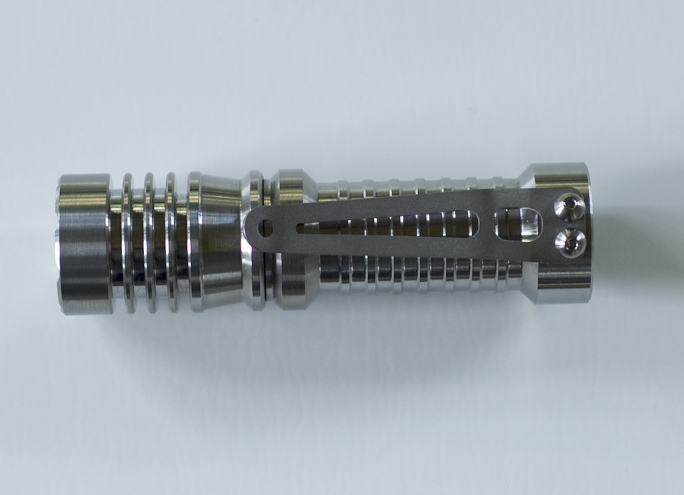 I have been real happy with the SunDrop 3S and I knew I wanted to use the 3S converter in a more "main stream" beam type flashlight. I personally have a strong preference for the XR reflectors coupled with the Cree XR-E LED's and the Haiku was a rather predictable result in design. I like the PD-S mizer but recognized with a 3 speed converter, I could have a mizer configuration and in addition, a turbo or bright mode on top. I think the dynamic range of the three levels is better suited to the XR reflector than the McR-20S coupled with a Seoul LED. I should point out that I believe the jagged curve on the medium level is probably due to the sampling of light taken every 30 seconds for the log and the fact that the 3S converter reduces the output on medium and low by virtue of PWM with the light pulsing on and off. It appears that the light can handle constant on in high but that is not the intention of its design or expected usage. The McR-17XR reflector selected for the Haiku has an exit diameter small enough, relative to the opening in the head, to allow most of the light out of the front end. The window seal O-ring and then the window retaining O-ring and inside diameter of the head are such to allow the direct spill of light from the LED access to the outside and not be restricted or reflected off by virtue of contact. In the image below, you can see how the O-rings and lip of the head all step out in diameter and away from the exit angle of the reflector itself. 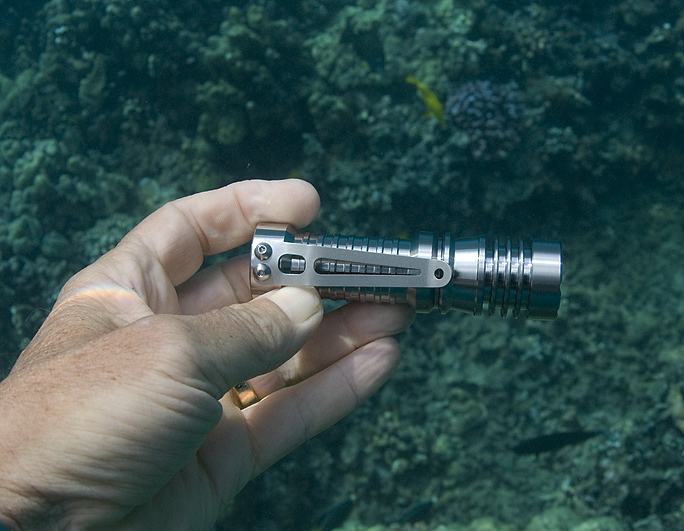 I don't consider the Haiku a dive light but like all of my Ti lights, the design is such that provided seals are in good shape and there is no dirt or crap to compromise them or their surfaces, the light should be more than up to environments that are less than ideal or dry. I wanted to make this post reasonably comprehensive and so I figured a beam comparison would need to be included. 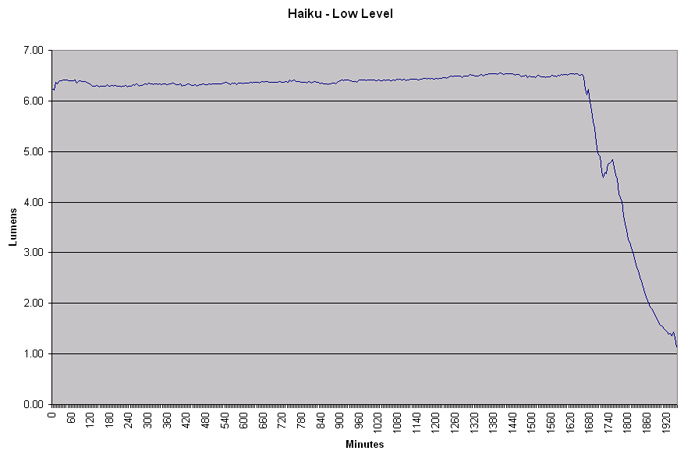 I chose to compare the Haiku with a Ti PD-S (P4 V0). The Haiku is 3 5/8" (9.2 cm) long. As I mentioned above, these are past the vapor stage and depending on whale visiting conditions, there will be a wave of these sometime next week. And of course nice light too, I think it will be very popular. What a great looking light! Another gorgeous light from Don! Cool looking head you have there don, and a smart head to boot. Thats one nice looking light Don! The Three speed platform is perfect for me and my lighting needs! 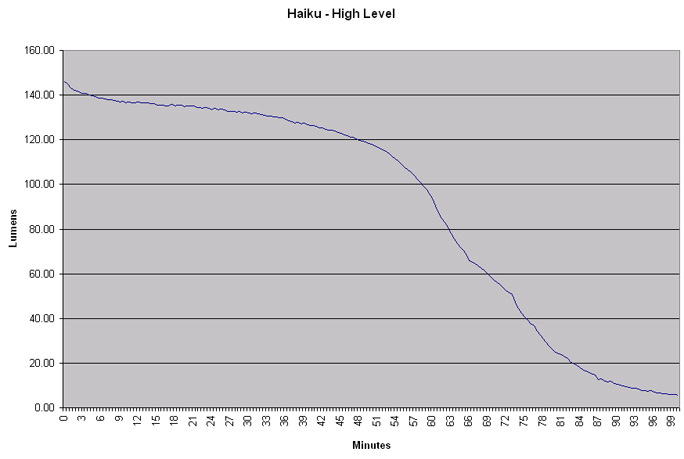 Low level has become very important for these old eyes and High is a must! Leaving mid-range for everyday use. Who is the Driver builder?? someone we know? Last edited by griff; 02-07-2009 at 11:50 PM. 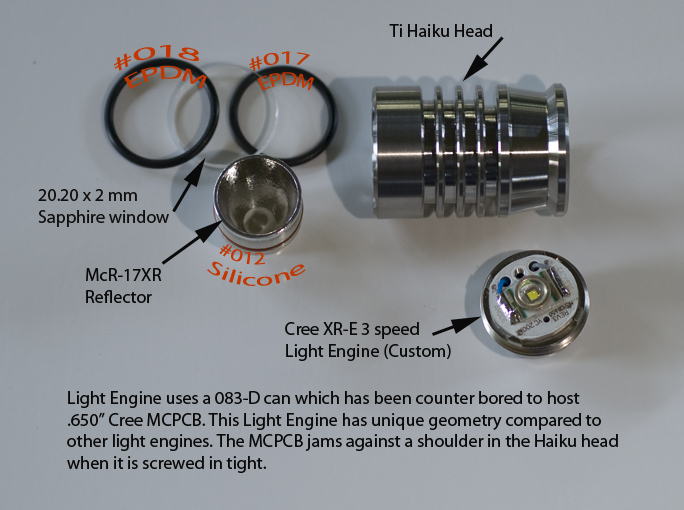 Love the design, glad the Master is back to Cree lights... one question though RCR123 , yes or no? How do you change levels? Does it remember the last level? Last edited by proline; 02-08-2009 at 04:12 PM. one question though RCR123 , yes or no? By the sounds of it, yes, just like the Sundrop 3S. The converter is the same one used in the SUnDrop 3S but with a sense resistor change to set the current level higher. It is good on a single cell, lithium primary or R123. The light comes on at the same level it was at before unless you have turned it back on in less than a second of having it turned off; in which case it cycles to the next level. In other words a very short off cycle is what shifts the speed. I have never dealt directly with the designer of the converter. I don't believe he speaks english and I certainly can't speak or type in Japanese. I am in indirect contact with him through my friend at pro-light.jp. That looks like another winner. , but I love your McR-__XR line of reflectors more! Can you provide a bit more details about the LE? Are those runtimes with primaries or rechargeables? I really like it. This seems like a somewhat unintentional extension of the Aleph line... compatibility with E-series bodies, for example, though I don't know enough about the light engine to say it is or isn't swappable with Alephs. I really like the design of the head, the fins get me every time! Don, I like the concept utilizing the 3S converter and also the higher output. I really like the UI on my Sundrop 3S and I bet this one will be equally amazing I will be in line for one next week. I'm guessing here but it looks like the dimensions of the head are similar to the venerable A1? 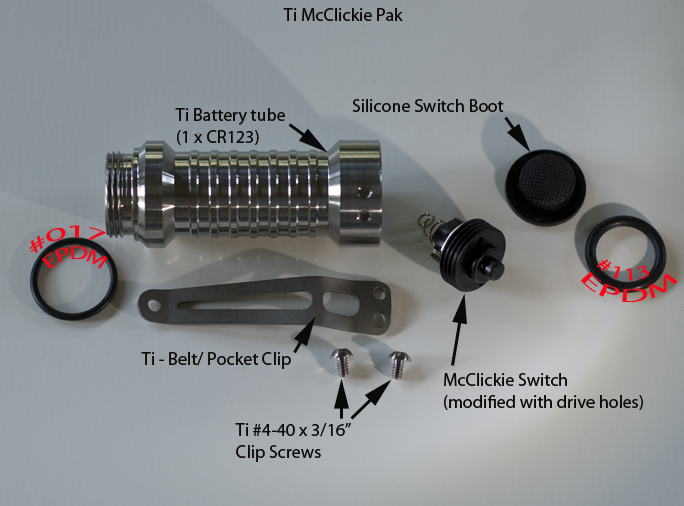 Chronos - As the Ti McClickie pak is compatible with the SF E-series i would say the head is also. Click once, light comes on. Click twice quickly, light dims down. Third click dims it more. Dangnabit, that blows! I'll get back here when I can do this proper! "Old LEDs never die, they just fade away." The run time tests were done with fresh out of the box SureFire CR123's. The head and pak are "E" series and Aleph compatible. The Light Engine though has different geometry than the XR can based light engines. The head and LE are not compatible with other heads and LE's on a sub component basis, to my knowledge. It is not obvious in the picture above but this LE is similar to the Nichia 083 LE in the SunDrop in that the MCPCB stands slightly proud of the can with its top surface ~ .015" higher that the top faces of the can's castle points. As with the SunDrop head, the Haiku head also has a shoulder inside the head that the MCPCB gets pressed up against when the LE is tightened in place. This puts the MCPCB in compression between the can and head enhancing the thermal conductivity paths on both the top and bottom of the MCPCB. The LE threads are already in tension within the head and this is an aid to thermal transfer. When the pak is screwed in tight in the head, the front lip of the pak is forced against the rear shoulder of the can and this contact surface is a good thermal path between LE and pak. The threads of the pak also provide a thermal path between it and the head. 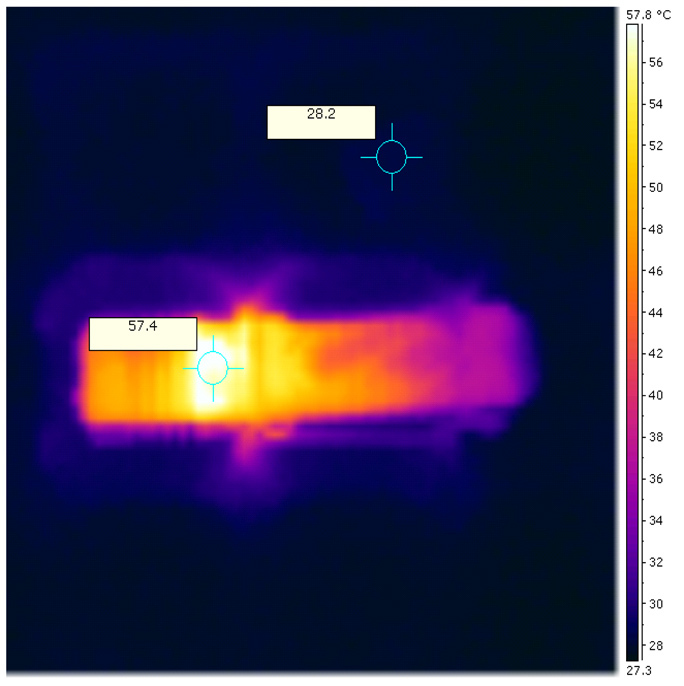 Since both the MCPCB and the can are aluminum, they will expand when they heat up and this expansion should add to the comresssion and reduce the thermal resistance between them and the titanium even further. Titanium will not expand nearly as much as the aluminum. If for whatever reason the light is left on on high and picked up later on, holding it by the tail is much easier on your hand than grabbing it by the head. You cn work you hand up the light as you bleed off the excess heat with your hand. When I assemble the Haiku head, I first install the LE and snug it tight in the head. 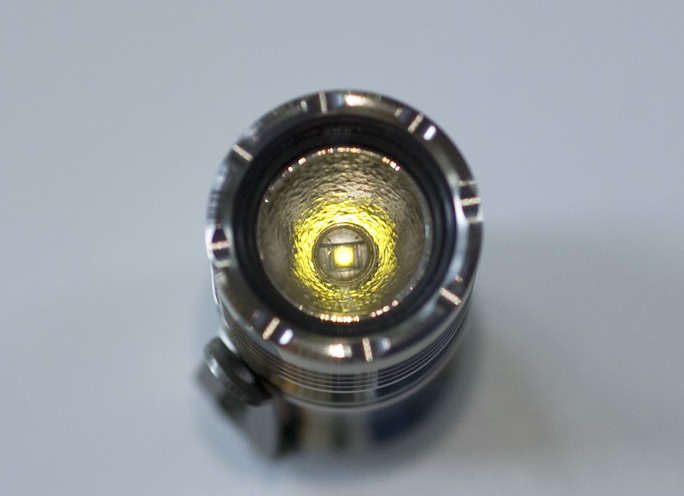 I then push the 17-XR reflector down into the bore from the front until it seats around the Cree LED. 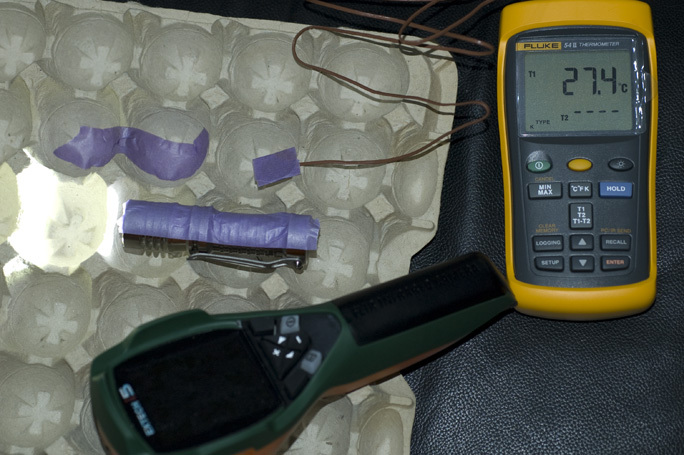 The silicone O-ring around the reflector provides resistance between the head and reflector and holds it in place. I then install the window seal, window and finally the window retaining O-ring. The Haiku is straight forward in both assembly and disasembly and even the LE can be broken down into its constituent parts, should the need arise. The MCPCB is staked at for points within the confines of the can but it is possible to pry in and separate and lift the MCPCB up from the can. If you desolder the input leads from the contact PCB then the converter can be pulled out and free from the can. I stake the MCPCB in place so that the LE is held together and the MCPCB won't rotate as the LE is installed in the head. once installed, the staking is superfluous. Will the Ti 2x123 McClickie Pak work with the Haiku?